For all you air guitar fans, the time has finally come for you to show off your mad skillz. 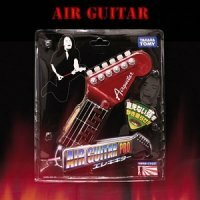 The Air Guitar Game has finally arrived on US shores, and it will come with 10 popular American as well as Japanese songs, with Stateside artists being Aerosmith and Deep Purple, with Japanese representation being taken up by The Blue Hearts and Southern All Stars. This unique device is capable of tracking your performance using infrared rays that are emitted from the bottom of your controller. Anyone game for it?